Hefeweizen is the original wheat beer and remains one of the best-known among the many styles of beer available on the market. 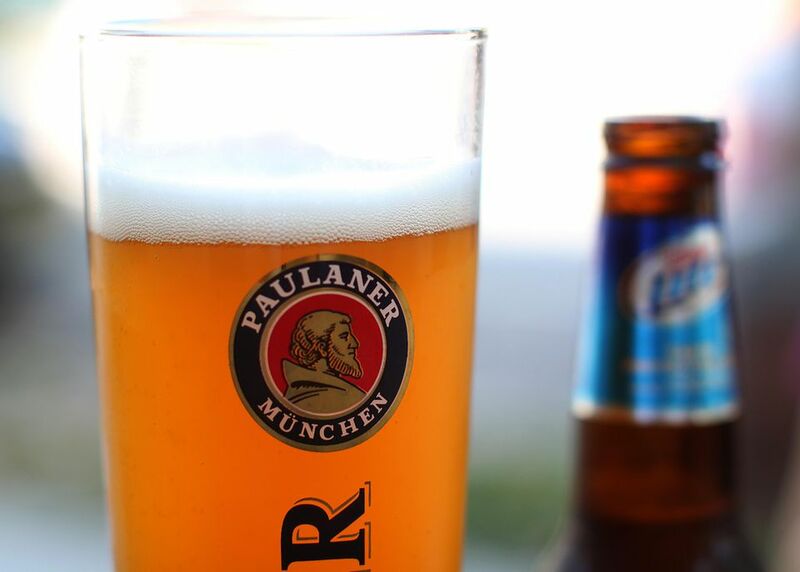 It originated in Germany and is a crisp, drinkable beer that is a favorite during the summer months. You can easily recognize it as the cloudy, pale brew that leaves a lot of yeast in an empty glass. Hefeweizen (pronounced hay-fuh-veyt-ssenn not haffie-vi-zon) is the more popular word among Americans for what Germans call weissbier or weizenbier. This style predates lagers and pale ales. Weissbier, which means "white beer," was initially used to described wheat beers because they were paler in color to the typical beers brewed in Germany. Hefe translates as "yeast" and weizen means as "wheat." Yeast in the name refers to the fact that this unfiltered beer remains cloudy thanks to the suspended yeast. The yeast also contributes unique qualities to the aroma and flavor of a hefeweizen. Wheat beers were among those forbidden under the German purity law known as Reinheitsgebot. Established in 1516, it essentially only allowed production of beers with no adjuncts or non-barley grains. Due to the popularity of weissbier among royalty, it was the first style to receive an exemption. This Bavarian wheat beer typically contains at least 50 percent wheat malts, though some can reach a ratio of 70 percent wheat to barley. The top-fermentation style designates hefeweizen as an ale. It's generally a crisp, drinkable brew with a low to moderate alcohol content. The suspended yeast gives hefeweizen a cloudy appearance, its most notable characteristic. Though many brewers produce hefeweizen, a distinct flavor profile can be used to describe this style. Classic hefeweizens are noted as being sweet and fruity with notes of banana and clove. Some will even have a bubble gum or vanilla undertone. It is a wheat beer, so it is heavy and it does have a rather full body. American hefeweizens aren't subject to the strict German production law. Due to this, they do vary a bit more in flavor. Some brewers use a different strain of yeast than the German recipe calls for and others may add citrus or spices. Wheat beers are best served in a specific style of glass, called a weizenbier glass. It looks like a modified tulip with a narrow base that opens up to a wider middle and then slightly tapers again at the rim. The shape helps form the desired white head when the beer gets poured. To pour hefeweizen, hold the glass at an angle and slowly pour the beer until the head reaches the rim. Wait for the foam to settle, then swirl the beer remaining in the bottle to agitate the yeast and continue pouring. Hefeweizen tastes best cold and in a glass that has been rinsed in cold water. It has become an American custom to serve hefeweizen with a lemon wedge. Traditionalists and Bavarians frown on this practice. They feel the citrus detracts from the true taste of the beer and prevents the creation of a perfect foam head.